Hanoi has had a turbulent 3,000-year-old history but this fascinating city still manages to reinvent itself. More recently Vietnam has welcomed Western travellers and an increasing number of these are exploring this beautiful and complex country. 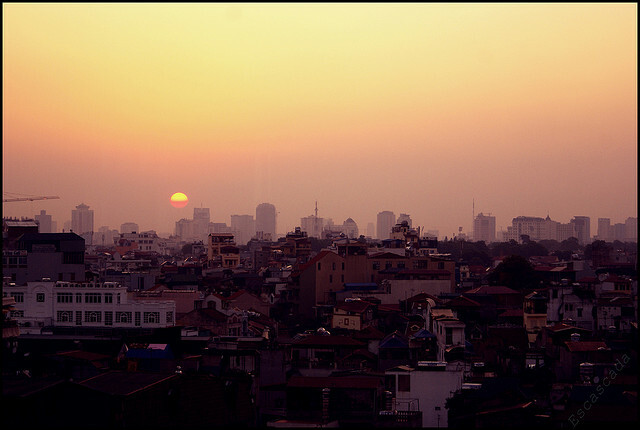 The capital, Hanoi, should be visited on any Vietnam tour. The city is busy, often very noisy but also it is rapidly gaining an international reputation for its art galleries. From the moment the Vietnamese government opened its doors to Western travellers in 1986, this country’s artists have been making their mark on the international art scene. Dealers as influential as the London based, Charles Saatchi have long featured the painters and sculptors of Vietnam on their websites. One of the most interesting galleries to visit is the Apricot Gallery, which features the work of Le Thiet Cuong, this painter’s work was so admired by former President Clinton that he even bought a piece to take back to the US. The Mai Gallery is also garnering a reputation far beyond Vietnam. To reach the gallery you will be able to take a fascinating walk through Hanoi’s Old Quarter with its intriguing shops and stalls, each street is devoted to a specific trade, until you finally reach your destination. Modern art in Vietnam is a fusion between the old and the new, using the ancient techniques of engraving and lacquer work and combining these ideas with contemporary themes. The Colonial French governed Vietnam until the mid 20th century and their influence is still abundant on the streets of Hanoi. The city is still dominated by their graceful boulevards complete with ironwork balconies; it’s unfortunate that the surrounding noisy traffic is so distracting that the ensuing racket can become quite intolerable at times. Motorbikes and mopeds are the main vehicles of choice. To learn more about Vietnam’s history a visit to the city’s History Museum housed within a stunning example of colonial architecture will prove to be rewarding. For those who wish to learn more about the country’s various ethnic minorities, then a trip to the Vietnamese Museum of Ethnology will provide a useful background to the many diverse peoples who occupy this extraordinary country. In common with the rest of the country Hanoi is a city of contrasts. Visitors still flock to see the body of Ho Chi Minh that is enshrined in his very own mausoleum, it is said that he had in fact asked to be cremated but the Communist authorities decided to emulate Moscow and thus the Vietnamese can go and gaze on the body of their late leader whenever they wish. After this unusual encounter you can always go and relax in the surrounding palace gardens.